How to Save BIG on Eco-Friendly Bags for Your Business! Get Our Favorite Reusable Bags at The Lowest Prices Ever Offered! For a limited time, we are running an eco-special on four of our staff’s favorite reusable bags. When you place a minimum order of 250 bags by March 31, 2018 you can secure EQP (end quantity pricing) on these great reusable bags. Learn more about the reusable bags our staff chose to include in this eco special and how to go about customizing your bags. The consumer’s expectation of convenience has boosted the value and necessity of delivery options in the food industry. For restaurants that don’t offer delivery themselves, mobile apps and delivery startups are filling those gaps. Creating a unique experience for the consumer in the food industry was once about face-to-face interactions. However, according to McKinsey & Company, the worldwide market for food delivery stands at about $96 billion. That makes up 1 percent of the total food industry and 4 percent of business for restaurants and fast-food chains. For the next five years, there is expected to be an estimated 3.5 percent annual growth rate. Delivery is already a linchpin in the lives of many and will continue to grow as access to mobile apps and online ordering becomes the norm. Traditional packaging for delivery commonly features a combination of paper bags and single-use plastic bags. They serve a purpose, transporting the food from point A to point B, but value for your brand and the customer is being left on the table. Below, we will explore 4 reasons why restaurants should invest in customized insulated tote bags as the successor to traditional food delivery packaging options. Make a lasting impression and save on promotional marketing with our latest eco special. You can enjoy next column pricing on our new Eco-Life insulated totes when you order 250 or more bags. Get your quote by August 30 and submit your order by September 15 to take advantage of this great deal. Our brand new Eco-Life insulated tote bags fill a consumer need and will effectively spread your branding message. Reusable cooler bags make excellent trade show promotional products. These bags are not your run of the mill trade show bag and people will be drawn to your booth to get one. 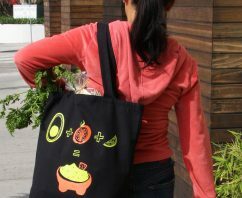 In fact, we are using the exact bag to hand out at The PMA Fresh Summit for our trade show marketing. Takeaways are a great way to get your brand noticed at a trade show. Giving clients an promotional item they can use and interact with, will help create a relationship between your clients, prospects and your brand. Reusable promotional products are proven to be effective marketing investments and will continue to engage with your customers long after the trade show is over. Trade show tote bags are always a popular takeaway, and can even help drive traffic to your booth. Here are 3 trade show tote bags to get your brand noticed at your next event, and long after that event is over. Make the most out of summer marketing by putting your logo on your choice of our most popular eco-promotional items to help your prospects and customers beat the summer heat! Choose one item, or all three, during the month of June and receive next column pricing. Take advantage of this summer pricing on eco-friendly promotional products HERE. According to the Advertising Specialty Institute (ASI), reusable bags generate more impressions in the United States than any other promotional item. Each bag generates a whopping 5700+ impressions. This is a staggeringly high amount. For such a low price, this is obviously a great return on your marketing dollar. Plus, you can choose a bag that fits with your demographic. Keep reading to learn how to select a reusable bag that will leave an impression with your customers. Looking For The Best Custom Reusable Bags? 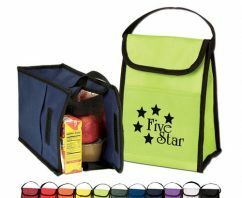 There certainly isn’t a one-size-fits-all approach to selecting the best custom reusable bag to market your brand. 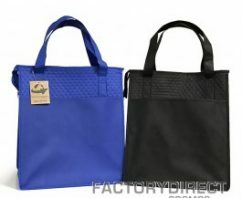 There are so many things to consider when designing a branded bag from the style and materials to the size and colors and even the information you have printed on the bags. A lot of things have to come together to create a bag that represents your business and delivers a value that will continue to market your brand for years to come. Here’s what to look for to find the best reusable bags for your brand. 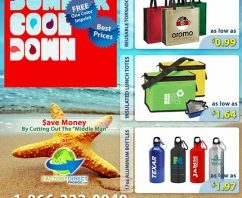 Custom Promotional Cooler Bags As Low As $0.59! 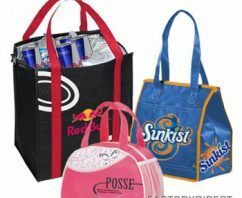 Custom promotional cooler bags are great to tote frozen goods home from the store, lunch to work or school, or snacks on the go, but no matter how your customers use a custom branded insulated bag they are certain to get your brand noticed. Our custom insulated bags start as low as 59-cents, so you can help your brand and your bottom line. Plus, now is the perfect time to promote your brand with a cooler bag.